The Coleyville Cemetery was originally connected with the Coleyville Baptist Church (earlier known as Mt. Walker). This church was established by German settlers who moved into the district from areas closer to Ipswich and Brisbane in the late 1860s. It was the successor to churches known as Normanby Reserve (est. 1868) and Bremer. About the same time, other German Baptist churches were being established at such places as Vernor (or Brisbane River), Marburg (1871), Minden (1879) and Blenheim (1895 - later moved to Laidley). The Coleyville church building was erected in 1872 on the block adjacent to the present cemetery on the western side. The land (1 acre) was donated by George Thorn as a place where Baptists “could worship God and bury their dead.” Original trustees were William Peters, Carl Dickfos and Carl Reik. The church building was used for 38 years when a new sawn timber structure was opened on Oct 16, 1910 closer to the village on the Mutdapilly-Coleyville Road, using some of the materials from the original building, at a cost of £160. The first burial in the cemetery took place in 1892; it is still in use, especially by members of long-standing district families, and is cared for by local residents, who also maintain its Burial Register. The cemetery was extensively renovated in 1995 (see The Valley Times, Dec 7, 1995). The earliest recorded Baptist meeting in the Fassifern area was held on Aug 22, 1875 in the home of C. Schossow. Previous to this, worship services conducted by Mt. Walker/Coleyville Baptist Church were held in various homes. Land was acquired off the present Edward St, Kalbar in 1876-7 and a slab-walled church erected. Later, a manse was built and in 1882 the old church was replaced by a larger structure. Nearby land for the cemetery was purchased from August Kutz in April 1884, trustees being Karl Krueger, Herman Huth and F. Wolter. The church building was enlarged in 1891, but ten years later, it was again proving too small. A move was made to the present site at the top of the hill in Edward St where a new building was erected and opened September 22, 1907 on land sold to the church by Mr August Schossow. This building was in use until replaced by the current church, which was opened Mar 6, 1965. The earlier name of the township and church was Engelsburg but it was changed to Kalbar during World War I. The church was also known as Ebenezer. The site of the Old German Cemetery is indicated by a sign in Edward Street. Records indicate that the earliest grave is 1885 and the latest 1923. The burial register remains in the possession of the Kalbar Baptist Church. 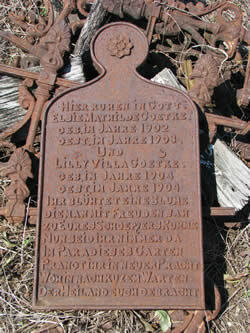 The Boonah Baptist Cemetery located in Red Bridge or Hoya Road is part of the original Baptist church site. The church was opened in May 1888, but services were held for about ten years before that in private homes, especially Fred Schneider’s, in the area which was known as Dugandan Station. The church was an outstation of the Baptist work at Kalbar (known then as Engelsburg). Eventually land was given by Mr Swartz, a storekeeper of Boonah, for the erection of the building, at which time the Boonah church became independent of Kalbar. This primitive building was extended in 1918, but by the 1920s it was quite inadequate for its purpose. So a decision was made in 1923 to move to the town area. Land was purchased in Church Street, the old building at Hoya demolished and the new church opened on Jan 1, 1927. In 1940 it was moved to the present block next door. This building is now the church hall, having been moved to make way for the present modern church which opened Oct 1, 1966. Most of the old church site in Red Bridge Road was sold in the early 1980s, leaving only the small cemetery area in the hands of the church. There are no burial records for the old Baptist cemetery, but the earliest marked grave is dated 1894, the latest 1911; there are several unmarked burials. Baptist burials since have mostly taken place in the town cemetery, records for which may be consulted at the Boonah Shire office. The Highfields area (originally known as Koojarewon), about 12 kms north of Toowoomba, was settled by 1870. The area at first attracted timber getters and then farmers, many of whom came from Ireland and Germany. Baptist services were commenced in 1877 in connection with the church in Toowoomba where work had commenced in 1875 following a visit by Rev. Wm Moore of Brisbane. The first baptisms were held in Highfields in July 1877; a church building, which was used by many local organizations and other churches, was erected in September 1878 on land given in 1875 by the Hartwig family. There are no burial records for the cemetery, which is now closed - making this a truly exclusive index and a treasure for anyone exploring their family history or building their family tree.